Between celebrities having children well into their 40s and companies adding “benefits” like egg-freezing technologies, women are lured into the belief that they can have children whenever they are finally ready. However, the biological clock is still alive and ticking when it comes to fertility. In 2001, the American Society for Reproductive Medicine (ASRM) launched an educational campaign titled “Protect Your Fertility” to inform women of these dangers.3 The campaign grew out of the ASRM’s increasing awareness of the problems associated with waiting too long to begin having children and a desire to give women the facts about what happens when they postpone pregnancy and childbirth. However, this empowerment eventually left Fleming on the “baby chase.”6 What do such baby chases entail, and what are the risks and harms? First, for the fertile woman seeking to postpone childbirth, it includes the latest scheme called egg freezing, but banking your frozen eggs does not erase the biological reality of maternal age. An ASRM report “states that live birth rates declined consistently with maternal age,” regardless of the method used to freeze eggs.7 Even if, under optimal conditions, we can freeze the eggs of a 30-year-old woman and give her a 13 percent chance of an implantation in her 40s, there is still a much higher risk of maternal morbidity and stillbirth. 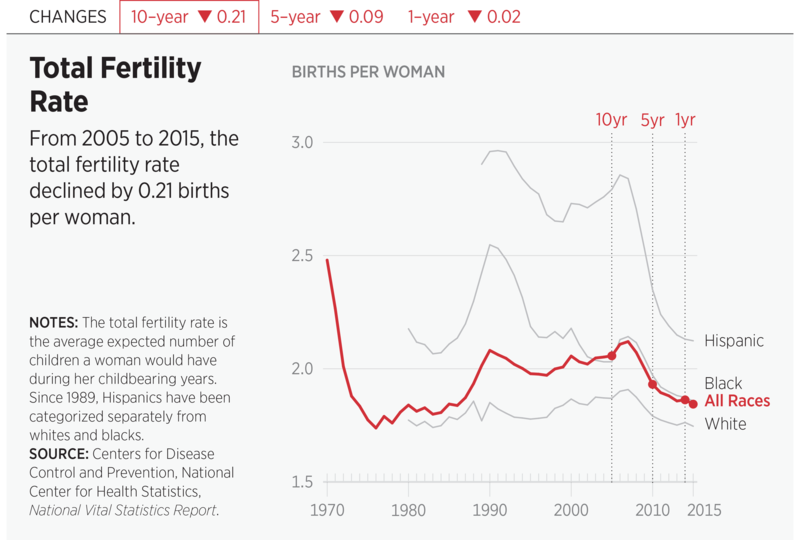 So what does all of this mean for declining fertility rates in the U.S.? It means that we need to do a much better job of educating people on the limitations of human fertility. These limits need to be discussed in light of the new novel “solutions” that lure people into thinking that we can defer motherhood to fit our own timeline. It also means that we need to stop practices that may bring harm to others: the children born from high-tech pregnancies as well as the women who are exploited for their healthy reproductive capacities. Jennifer Lahl is Founder and President of the Center for Bioethics and Culture Network. http://www.gallup.com/poll/191462/gallup-analysis-millennials-marriage-family.aspx (accessed April 25, 2017). http://www.businessinsider.com/why-delaying-parenthood-and-having-kids-later-is-a-big-deal-2015-6 (accessed April 21, 2017). http://www.cbsnews.com/news/the-biological-clock/ (accessed April 25, 2017). 5. Anne Taylor Fleming, Motherhood Deferred: A Woman’s Journey (New York: G.P. Putnam’s Sons, 1994), p. 15. 6. Holly Finn, The Baby Chase: An Adventure in Fertility (San Francisco: Byliner Inc., 2011). https://www.cdc.gov/nchs/data/nvsr/nvsr64/nvsr64_09.pdf (accessed April 17, 2017). 11. Anne-Marie Nybo Anderson, Jan Wohlfahrt, Peter Christens, Jørn Olsen, and Mads Melbye, “Is Maternal Age an Independent Risk Factor for Fetal Loss?” Western Journal of Medicine, Vol. 173, No. 5 (November 2000), p. 331, https://www.ncbi.nlm.nih.gov/pmc/articles/PMC1071156/ (accessed April 17, 2017). 13. Marte Myhre Reigstad, Inger Kristin Larsen, Tor Åge Myklebust, Trude Eid Robsahm, Nan Birgitte Oldereid, Louise A. Brinton, and Ritsa Storeng, “Risk of Cancer in Children Conceived by Assisted Reproductive Technology,” Pediatrics, Vol. 137, No. 3 (March 2016), pp. 1–14, http://pediatrics.aappublications.org/content/pediatrics/early/2016/02/02/peds.2015-2061.full.pdf (accessed April 17, 2017); Sheree L. Boulet, Russell S. Kirby, Jennita Reefhuis, Yujia Zhang, Saswati Sunderam, Bruce Cohen, Dana Bernson, Glenn Copeland, Marie A. Bailey, Denise J. Jamieson, and Dmitry M. Kissin, “Assisted Reproductive Technology and Birth Defects Among Liveborn Infants in Florida, Massachusetts, and Michigan, 2000–2010,” JAMA Pediatrics, Vol. 170, No. 6 (June 6, 2016), pp. 1–9, http://jamanetwork.com/journals/jamapediatrics/fullarticle/2506140 (accessed April 17, 2017); and Center for Bioethics and Culture Network, “Three Things You Should Know About Third Party Assisted Reproduction,” pp. 1–2, http://www.cbc-network.org/pdfs/3_Things_You_Should_Know_About_Third_Party_Reproduction-Center_for_Bioethics_and_Culture.pdf (accessed April 17, 2017).